Preheat oven to 350 degrees F (175 degrees C). Poke holes in the sweet potatoes with a fork, arrange the sweet potatoes on a cookie sheet. Grease an 11x7 inch glass baking dish. Bake sweet potatoes for 1 hour. Let cool, then mash in a large bowl. There should be approximately 3 2/3 cups of mashed sweet potato. Combine softened butter with brown sugar, nuts, coconut and flour; stir with a fork. Set aside. 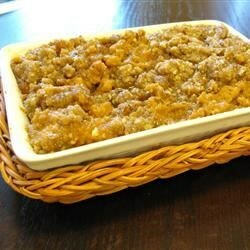 Combine sugar, eggs, milk, orange peel, butter, vanilla, salt with the mashed sweet potatoes. Beat the mixture with an electric mixer until smooth. Pour mixture into prepared baking dish. Sprinkle the brown sugar-nut mixture over the top of the mixture. Overall, a good dish, but had way too much orange flavor that overpowered the other flavors. I would suggest cutting back the orange zest or eliminating it altogether.